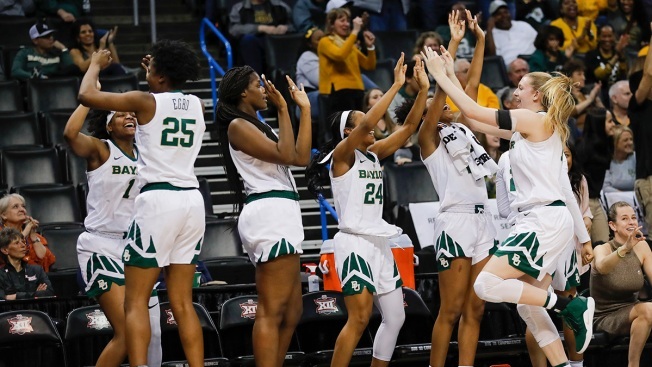 FILE - The Baylor bench celebrates after defeating Texas Tech in an NCAA college basketball game in the Big 12 women's conference tournament in Oklahoma City, March 9, 2019. One of the joys of March Madness is the surprising things that can happen during the NCAA Tournament. For the women, there was an unpleasant surprise before the tournament even began when the field was revealed early thanks to a production error. The Fighting Irish will potentially play their first two games at home before only having to drive 90 minutes to Chicago for the regional. Other top teams in the Irish's region are Stanford, Iowa State and Texas A&amp;M.